Marcio Stambowsky at his first Brazilian jiu jitsu class at the New Canaan YMCA on Dec. 11, 2017. 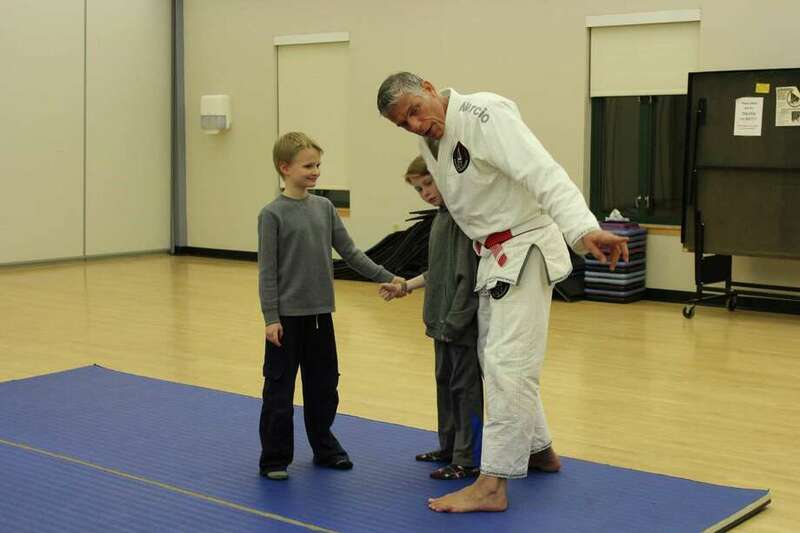 NEW CANAAN — Marcio Stambowsky, a 1981 and 1985 Brazilian jiujitsu national champion who revolutionized some of the techniques in the sport, towers over the four students that have come to his first self-defense class at the YMCA. His Brazilian accent thunders throughout the room. “Every time before you step on the mat, you have to bow and show respect,” Stambowsky said. The kids, like miniature soldiers, lined up and paid their respects before turning loose on the soft surface. He lets them release seconds of youthful energy but becomes serious again. “Show me respect, criss-cross applesauce,” he said to the kids as they giggled and played around the mat. Once the orders were given, however, they sat in the respective position and listened attentively, eyes wide open. An eighth-degree coral belt in Gracie jiujitsu and one of the original five black belt students of Brazilian jiujitsu legend Rolls Gracie, a family known for founding the discipline, Stambowsky has left his mark in the jiujitsu world. At 58 years, Stambowsky still maintains the combative prowess and technique that brought him to the forefront of the sport in the 1980s. Back in his hometown of Rio de Janeiro, Stambowsky was just another kid surfing and passing time on the beach. His long and skinny physique earned him the nickname “Macarrao”, or pasta. “My son is spaghetti,” he said with a chuckle. Additionally, Schwartzstein believes that the discipline instills values — respect, confidence, discipline, hard work, self-esteem and patience — which are promoted by the YMCA. Stambowsky gave a brief crash course on the history of the sport, more to the parents than the kids in the room. His white gi, the traditional wear for jiujitsu, was in sharp contrast with his taut, tan skin. He had returned from Rio de Janeiro only last week. “I brought acai,” he admits, a berry native to South America and known for its health benefits. Watching Stambowsky teach the movements of basic drills, such as getting out of handlock and falling down in a defensive position, demonstrates a softer side of his battle-hardened persona. He can’t help but call his students “champs” when they perform the motions correctly. At one point, the kids “overpower” Stambowsky and pin him down on the mat, though he doesn’t tap on the mat, a signal that one has submitted. Stambowsky only needs a few graceful motions before he is freed from their grasp. “Will you teach us how to do that?” asks one of the students as Stambowsky nods slowly.